Tank Temperatures - What Is Too Hot? - What Is Too Cold? Many aquarists ask, what is the optimal temperature for my saltwater aquarium? Unfortunately, there is not simple, straightforward answer to this question. The choice of temperatures in an aquarium are as varied as their owners. Some aquarists feel that keeping your tank between 75-77 degrees is best, some say 75-80 degrees. Others feel that some corals and fishes, having come from warm tropical waters, do much better at higher temperatures of about 80-85 degrees, or higher. In Ronald Shimek's Aquarium Frontier's On-Line Magazine article What are Natural Reef Salinities and Temperatures...Really...and Does It Matter? he makes the point that the corals you have in your tank come from many different ocean water temperatures ranging from 72 degrees up to about 92 degrees. He states that "Maintaining a tank in the upper 70 degrees Fahrenheit (24 to 26 degrees Celsius) range will stress any reef inhabitants from the central Indo-Pacific, as it is too cold. And, because this is near the upper limits for subtropical organisms, it will stress them as well. It would be better for all concerned if aquarists concentrated their efforts on maintaining separate systems for organisms from geographically disparate areas." Knowing what kind of animals you have and where they come from play an important part in deciding what is the best tank temperature for your aquarium. In response to Ronald's article, Richard Harker states in his Reef Tank Temperatures - Another View article, "A hobbyist who decides to increase the temperature of his or her tank needs to make sure that it is a stable tank with healthy corals, no sign of algae and has equipment necessary to efficiently remove the increased waste products. Under these conditions, it would be safe to increase the tank's temperature." However, he feels that rather than trying to run your temperatures high, you should reach a happy medium at about 79 degrees. He further states that "This temperature provides the largest margin of safety for the hobbyist, as corals have been shown to thrive in water several degrees on either side of this temperature". In a closed system, there may be excess metabolic wastes to deal with. If these excess wastes are not removed properly, with high tank temperatures this may cause problems like uncontrollable algae blooms and fish or coral diseases that thrive in warmer conditions. In open ocean waters, there is plenty of current and other ocean organisms to control these problems. Warmer water results in the lack of dissolved oxygen in the water. The loss of dissolved oxygen can suffocate and kill the occupants in your tank much faster than higher temperatures will. But, having good water movement and ample surface and tank aeration, this problem can be controlled. Rapid or drastic temperatures changes can have a very detrimental effect on the zooanthellae algae which are essential for providing nutrition to a vast majority of corals. Temperature changes can force the resident zooanthellae to abandon the coral resulting in coral bleaching and the eventual demise of the coral. As you can see, opinions on this topic are as wide-ranged as the different kinds of tanks you maintain. However, the main consensus seems to be that any animal exposed to quick changing water temperatures will be stressed and probably die, but with gradual acclimation, animals are amazing creatures and can adjust to their environments. 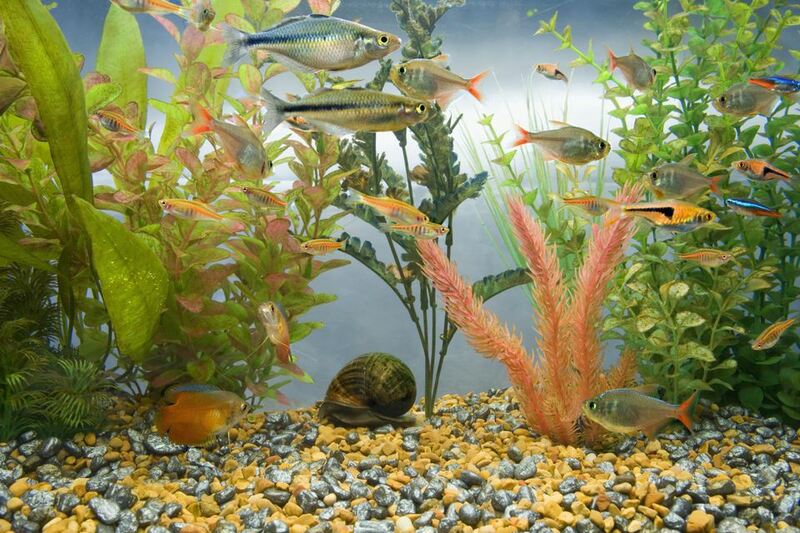 Higher temperatures may present problems for some of your tank inhabitants, but tank temperatures constantly changing in degrees too much up or down in short periods of time seems to be more of a threat. If you are having extreme problems of constantly fluctuating temperatures, that vary more than four degrees or better, up or down, one of the first solutions is to add a chiller. Chillers allow you to keep warmer or cooler temperatures at a precise setting at all times, which seems to be the most important factor.